Up to 60 minutes fire protection for paper tested and approved by ECBS to LFS 60P (EN 15659). Electronic combination lock powered by 4 x AAA batteries (included). Secured by two 15mm live locking bolts and one fixed dog bolt. The Firebrand MK/II Size 2 by Burton Safes is Fire Proof and is tested to protect paper from fire for up to 60 minutes to EN 15659 LFS 60P specification. The safe is secured with an electronic combination lock, powered by batteries and has a recommended cash rating of €1,000 or valuables rating of €10,000. Although the safe is quite large compared to others typically sold for home use fits perfectly into our home office. The most important factor for choosing this safe was that it was able to house all of our important paperwork, most of which is at least A4 size. In addition the drawer is very useful for taking passports and credit cards etc so they are easily accessible. The keypad is easy to use and the door swings nice and wide open giving easy access to all the documents etc inside. We have additionally added stick on hooks on the inside of the door to store spare car keys, which is an added bonus. Offshore UK Islands and Ireland. Read more about delivery on our Delivery Guide and FAQ. Can this be fitted to a wall as well as the floor please? 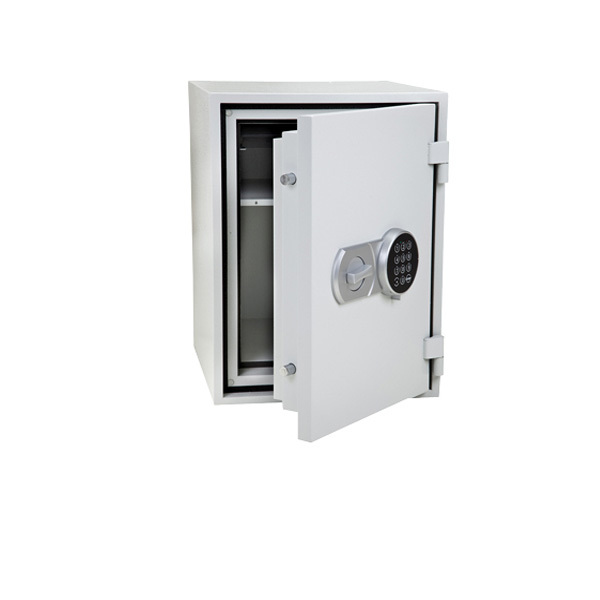 To keep the internal temperature as low as possible this safe cannot have holes in the back as well as the base. Take a look at our 60 minute rated fire safes with floor fixings all of which can be bolted to the floor. There are many fire safes with wall fixingsthat can be bolted to the wall, but they only offer 30 minutes fire protection. All questions are answered by our own expert advisors. The Flame Retardant Document Wallet offers additional protection for A4 documents inside a safe. Made using the same material as a fireman's uniform and tested to BS5438 Method 2. Our interior light includes 6 extra bright LED’s making it perfect for illuminating the inside of your safe. Fixed by magnet or adhesive pad and powered by 2 x AAA batteries (not included). Important: we offer free delivery on all options providing they are ordered with the main product. If you are interested in ordering just an option please contact us as a minimal delivery cost will apply. Of the customers who viewed the Burton Firebrand MK/II Size 2 on this page and went on to make a purchase, 7% bought this product. Below are the top 3 products bought by customers who did not buy the Burton Firebrand MK/II Size 2.